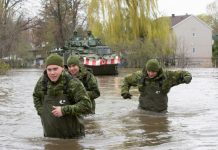 Sûreté du Québec Sgt. Christine Coulombe says the victims range in age from 35 to 70. Some of the wounded are considered to be in critical condition. Thirty-nine people escaped the Islamic cultural centre of Quebec in the Sainte-Foy neighbourhood without injuries, according to Coulombe. 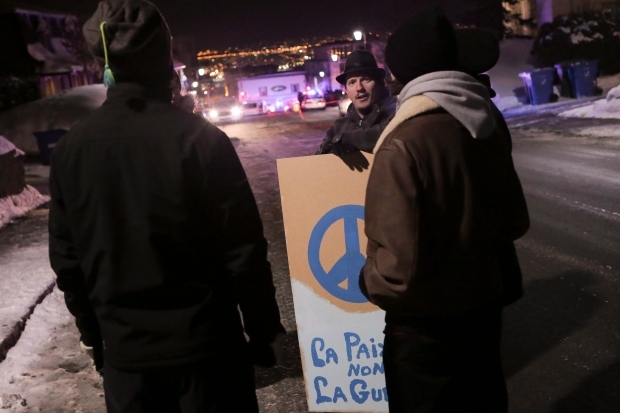 Quebec Premier Philippe Couillard said it was obvious that the shooting should be treated as an act of terrorism. “It’s an murderous act directed at a specific community,” he said at a press conference just after 1:30 a.m. Earlier Couillard said that “Quebec categorically rejects this barbaric violence” and offered solidarity with the families of the victims. Canadian Prime Minister Justin Trudeau condemned the shooting, which he described as a “terrorist attack on Muslims in a centre of worship and refuge,” in a statement. “Muslim-Canadians are an important part of our national fabric, and these senseless acts have no place in our communities, cities and country,” said Trudeau. Quebec City Police Const. 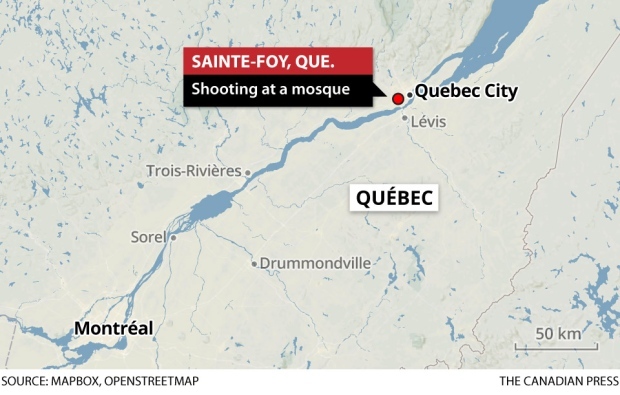 Étienne Doyon said mostly men were gathered inside the mosque when the shooting began just before 8 p.m.
At the moment of the attack, the men were praying on the ground floor of the building, while women and children were upstairs. Two suspects were arrested, one of whom was apprehended after a chase that ended near l’île d’Orléans. “The building is secure and the occupants evacuated. The investigation continues,” Quebec City Police tweeted. 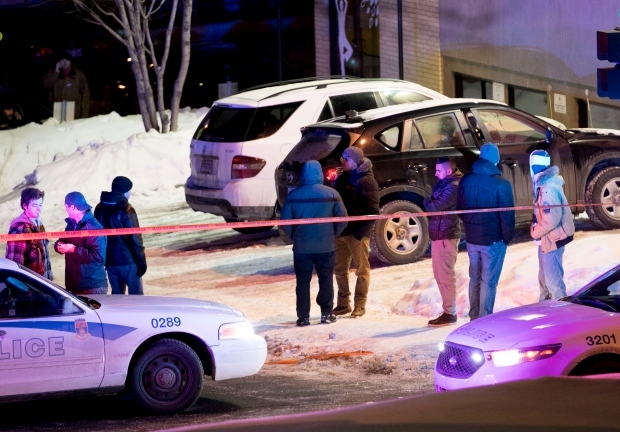 Quebec City Police said they are working with the RCMP and the Quebec provincial police. “It seemed to me that they had a Québécois accent. They started to fire, and as they shot they yelled, ‘Allahu akbar!’ The bullets hit people that were praying. People who were praying lost their lives. A bullet passed right over my head,” said the witness. Quebec City Mayor Régis Labeaume fought back tears, saying the city is in mourning. “To the Muslim community, our neighbours, our co-citizens, who count on our support and solidarity, I want to say, ‘we love you,'” said Labeaume. Couillard also wanted to share a message of solidarity with Quebec’s Muslim community. Politicians across Canada and the world have also joined in to tweeted their support for the mosque, while denouncing the act. 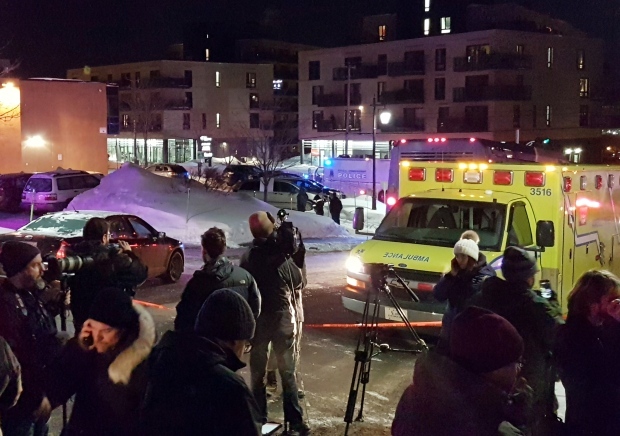 “Horrified at the news of a shooting in a mosque tonight in Québec City. We stand with our Muslim neighbours against this act of hatred,” NDP leader Tom Mulcair tweeted. The administration of the mosque thanked citizens for their outpouring of support on their Facebook page late in the evening. “Thank you for the hundreds of compassionate messages coming from everywhere,” the mosque wrote. Vigils have been planned for the coming days across the province. 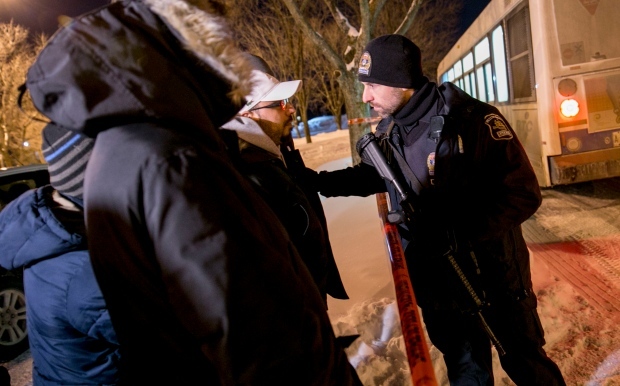 Quebec Public Security Minister Martin Coiteux said that places of worship across the province have been placed under surveillance, with police is Quebec City have been deployed around close to a dozen places of worship. Both Montreal and Gatineau, Que., said they will be increasing security and surveillance in the wake of the shooting. The incident comes at the end of a weekend in which thousands were detained at U.S. airports, and thousands of others protested across North America, as a result of a temporary travel and refugee ban concerning seven Muslim-majority nations which new U.S. president Donald Trump signed off on in an executive order. The Islamic cultural centre of Quebec, meanwhile, has been the target of vandals in the past. Last June, during the Muslim holy month of Ramadan, a pig’s head was left on the doorstep of the mosque. Authorities are asking anyone with information into Sunday’s attack to contact Quebec provincial police at 1-800-659-4264.